Anytime someone takes a peek in my closet, they say “oh, you love shoes don’t you? !” Why yes, yes I do. I always have and always will love shoes. And if we ever move into my husband’s dream tiny house (help me), which shoes to take and where to store them will most likely be an issue. Unless we live right on the beach and then I’m pretty sure I can narrow it down to 3 pairs: flip flops for beach walking, wedges for going out and sneakers for beach running. Done. I think my biggest weakness when it comes to shoes are flat sandals. They’re comfortable, can be worn with just about anything and when designed just right, can elevate an outfit in an instant. Check out this season’s statement-making flat sandals. Did any of these catch your eye? The Patricia Gladiator Sandal is calling my name. I would love to wear these with a black maxi dress or romper. 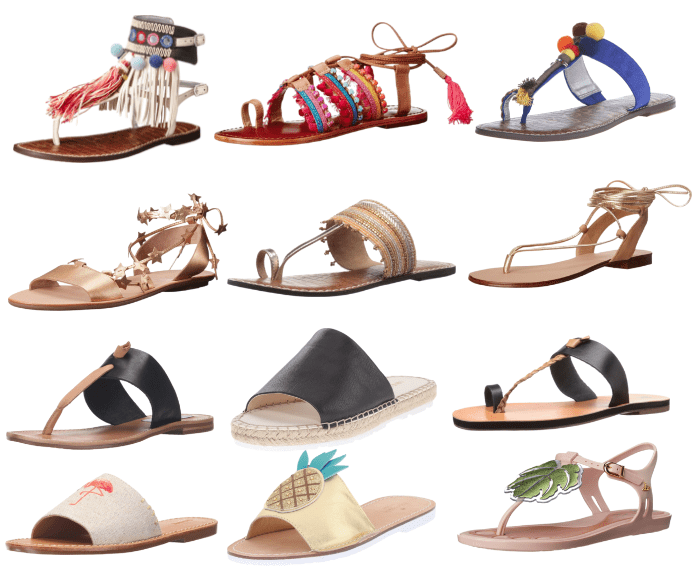 Tell me, what’s your go-to summer shoe?